My sister’s birthday was on 12/12/12. A while back she was on pinterest and saw this recipe and emailed it to me. She wrote “Mmmmm, these look good. We should make them.” So I made them for her on her birthday. They are really good. Taste exactly as you would imagine…. mint and chocolate, the perfect combination! Heat oven to 350. In large bowl, stir cookie mix, butter, mint extract, food coloring, and egg until dough forms. 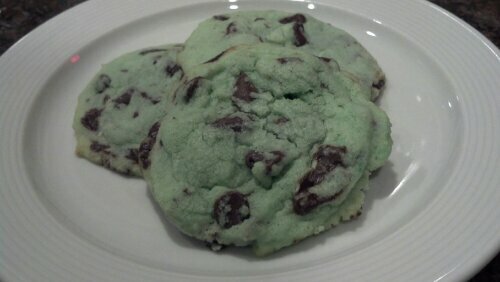 Stir in creme de menthe pieces and chocolate chips. Use a cookie scoop and arrange 2 inches apart on ungreased cookie sheet. Bake 10-12 minutes or until set. Cool and enjoy!